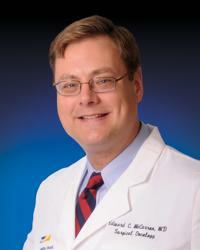 Edward McCarron, MD, is a board certified surgeon fellowship trained in surgical oncology. An integral part of the oncology team at the Harry and Jeanette Weinberg Cancer Institute at MedStar Franklin Square Medical Center, Dr. McCarron treats a wide range of cancers using some of the most advanced surgical technologies available. He specializes in the treatment of melanoma, endocrine disorders, and gastrointestinal malignancies. Dr. McCarron is a Fellow of the American College of Surgeons as well as a member of the Society of Surgical Oncology and the American Society of Clinical Oncology. When he is not practicing medicine, he enjoys fishing, walking, and watching sporting events. Edward McCarron, MD, named a 2017 "Top Doc" by Baltimore Magazine for surgical oncology. Learn more about the Maryland Melanoma Center.